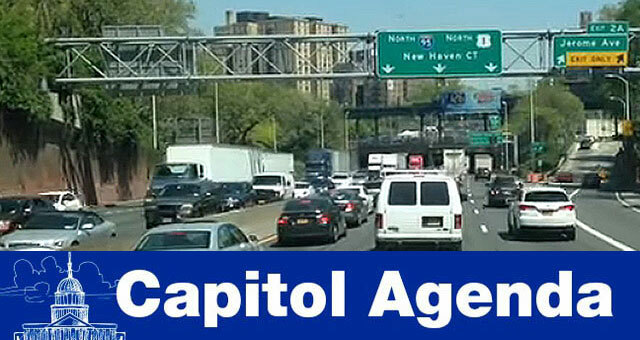 The dilapidated stretch of Interstate 95, or the Turnpike, along Newark’s metropolitan region in beautiful New Jersey needs to be repaired soon, and raising federal taxes on fuel is the way to go about it, Rep. Donald Payne Jr. said amid Congress’ debate on tax policy. Payne joined the small group of congressional lawmakers who urge colleagues to support a tax increase for gas and diesel fuel. Because, as he put it, such an increase would enhance the environment for businesses transporting goods and services in the very busy corridor. The portion of I-95 running through Essex County “is in terrible shape,” Payne explained, noting the intricate network of ports, railways, highways and an international airport in Jersey’s largest city has been neglected over the years. Freight mobility has suffered as a result. Not so long ago, New Jerseyans acknowledged a need for repairing their infrastructure when they approved an increase to the state’s fuel taxes. The Garden State became one of two dozen states to raise fuel taxes, absent an increase at the federal level. A report by the American Society of Civil Engineers found that 1 in 11 bridges in the Garden State are classified as structurally deficient, meaning they are deteriorating or severely damaged. The state is home to 6,657 bridges. “Republicans ran on a promise to rebuild America’s infrastructure, but the GOP tax scam working its way through Congress does nothing to fix the gas tax and rebuild transportation infrastructure. Raising the federal gas tax to reflect today’s economy is necessary to keep Americans safe and our economy competitive,” Payne added. Prior to passing their tax bill, senators rejected a motion that would have utilized repatriated revenue for infrastructure. Funding advocates saw a missed opportunity to boost the Highway Trust Fund during the tax bill’s consideration. The Transportation Construction Coalition encouraged industry players, as well as investment advocates to urge lawmakers for a long-term fix to the trust fund as tax negotiations come to an end. Earlier indications from the White House and the transportation secretary was that they would unveil an infrastructure funding proposal after tax policy is overhauled. Recent reports have signaled President Donald Trump might turn his focus to health care, and not infrastructure, after tax reform. For more than two decades, the federal highway account has relied on a 24.4-cents-per-gallon diesel tax, and 18.4-cents-per-gallon gas tax. Dec. 5, 10 a.m.: The Senate Committee on Health, Education, Labor and Pensions will consider the nomination of former FedEx executive Scott Mugno to be assistant secretary of labor for Occupational Safety and Health Administration. Dec. 6, 8:30 a.m.: The Atlantic hosts an infrastructure summit with Puerto Rico Resident Commissioner Jenniffer González-Colón (R); James Dalton, director of civil works for the U.S. Army Corps of Engineers; and Kristina Swallow, president of the American Society of Civil Engineers. Dec. 7, 10 a.m.: House Highways and Transit Subcommittee hosts a roundtable on emerging technologies in the trucking industry. J.B. Hunt will participate in the discussion. OH CANADA: Mandating electronic logging devices in Canada would separate conscientious fleets from those who do not prioritize safety, according to Stephen Laskowski, president of the Ontario Trucking Association and the Canadian Trucking Alliance. SBTC: The Small Business in Transportation Coalition, a trade group representing truckers, carriers and brokers, said it is suing the Indiana Department of Revenue for $1 billion. DRIVER PAY: Driver pay and other incentives are on the rise, spurred by a growing economy, tight capacity, driver turnover and a persistent shortage of drivers, leaders from the National Transportation Institute recently told investors from Stifel, Nicholas & Co.
Safety and autonomous technologies likely will be the focus of the Dec. 7 roundtable at the House Highways and Transit Subcommittee, sources told us. Shaun Courtney in BloombergBNA explores the infrastructure timing question. Repairing Arlington Memorial Bridge underscores President Trump’s commitment to rebuilding American infrastructure and is a major step in addressing the National Park Service’s $11.3 billion maintenance backlog. The Capitol Christmas Tree gets a shout out from Sen. Jon Tester (D-Mont.). Capitol Agenda publishes when Congress is in session. E-mail emulero@ttnews.com with tips. Follow @eugenemulero and @transporttopics on Twitter.